Cannonball Adderley is one of the greats in alto saxophone history. Cannonball Adderley got popular just after Charlie Parker's death and at first was called the "new Bird". He was not a new Bird, but he was a great sax player in his own right. His hard-edged tone and blues and soul influenced playing presaged the development of hard bop. 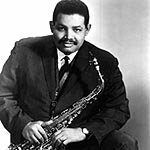 Julian "Cannonball" Adderley was born in Tampa Florida on September 15, 1928. His nickname, Cannonball, was derived from a high school nickname, Cannibal, based on his voracious appetite. From a musical family, he formed his first jazz group while still in high school. He became band director at Dillard High School in Ft. Lauderdale, Florida from 1948 through 1956. He had a jazz group in south Florida from 1948 through 1950 and led military dance bands for three years after that. In 1955 he sat in with Oscar Pettiford in Bohemia, New York and made such an impression that he was quickly signed to a recording contract with EmArcy Records. Cannonball Adderley formed a quintet which included his younger brother Nat on cornet. This quintet was not a commercial success and disbanded a year and a half later when Cannonball was invited to join Miles Davis's quintet. Soon after he joined Davis expanded to a sextet by adding John Coltrane on tenor sax. Adderley's bluesy style on the alto contrasted to Coltrane's freer chord based style and the combination of the two had a large part in developing the sound of this famous Davis sextet. Among this group's recordings were Milestones and Kind of Blue - the best selling jazz album of all time. Davis also appeared on Adderley's 1958 release Somethin' Else. In 1959 he formed another quintet with his brother Nat and this time the group was successful. They had a hit that year with pianist Bobby Timmons and his song "This Here". The group was established for future work. For the next sixteen years the Adderley brothers had a quintet or sextet and the group had many more jazz hits. Alumni of the group include pianists: Bobby Timmons, Victor Feldman, Joe Zawinul and George Duke; bass players: Sam Jones, Walter Booker and Victor Gaskin; sax players: Yusef Lateef and Charles Lloyd; drummers: Louis Hayes and Roy McCurdy. Nat Adderley was a constant presence on cornet and also composing songs. Cannonball Adderley's career started as Charlie Parker died and bop was dominant in jazz and extended through the time when avant guarde and free jazz were challenging (and sometimes losing) listeners. The soulful, bluesy style he played was always accessible to listeners. His playing was influenced originally most by Bird and Benny Carter and later the influences of John Coltrane, Miles Davis and Bill Evans can be heard. Even as Cannonball's style developed he always had a soulful joyousness to his playing. Later in the jazz chronology, the playing of Adderly along with others like Art Blakey and Horace Silver came to be considered the start of hard bop. The evolution of his music was stopped by his untimely death from a stroke in 1975.